When will AT stop building dangerous pinch points? When a few weeks ago we expressed our concerns about Auckland Transport disestablishing their specialist walking & cycling team, AT’s CEO Shane Ellison responded that cycling was “no longer in ‘start-up’ phase”, and that it was time to spread the bike skills around the whole organisation and make active transport part of core business activities. A laudable goal – but what is the reality? What are we to make of it when Auckland Transport, year after year, project after project, continues to trade off the safety of people on bikes for minor improvements to the safety of pedestrians? Pinch points, places where the road suddenly narrows, are scary to experience on a bike. You’re riding in relative safety at the edge of a wide road when an obstacle suddenly appears in your way and forces you to make a choice. Either you merge with heavy and/or speedy traffic; or you come to a full stop at the obstacle, which makes it even harder to safely merge back into traffic to get past the pinch point. And if you do “claim the lane” to get through the narrow bit, you might experience a close pass by a careless (or angry) driver trying to squeeze through the pinch point themselves. The worst pinch points are those on big wide streets with little (or little-used) parking, where drivers tend to speed and don’t expect a person on a bike might suddenly have to swerve into “their” lane, or think they can squeeze past anyhow. For all these reasons and more, pinch points should be avoided, and the design guides are very clear on this. Auckland Transport’s own Code of Practice (Section 13.3.10) and NZTA’s Pedestrian Planning and Design Guide (Page 15-9) both recommend a lane width of at least 4.2-4.5m, so a person on a bike can be safely overtaken by someone in a car who just can’t hold back. Yet Auckland Transport keeps building pinch points, adding more and more around our city, like little land mines for people on bikes. Spots of danger and unpleasantness, where a stressed glance over your shoulder is the minimum, where scary moments are common, and sideswipe crashes are much more likely. Why. Why does Auckland Transport do this? In short, it’s because one part of Auckland Transport has clearly gotten the message that our roads are too wide for pedestrian comfort and safety. Awesome. We agree. 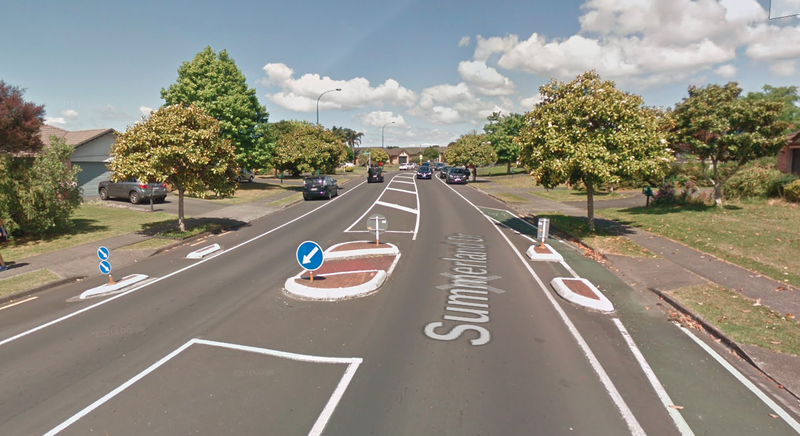 For decades, Auckland built two-lane streets wide enough to transform into four lanes without even moving any kerbs – even if they only led to a few dozen houses. Width was king. Width was good. Width was speed, capacity and even thought of as “safety”, in that cars could pass each other at high speed with plenty of space between. Clearly, this has to change (and in new subdivisions, it slowly is). But in the meantime, we have all those wide roads all over Auckland, which are hard for people to cross, and which encourage drivers to speed. And one of the results of this epiphany – that wide roads are bad for pedestrians – is that the people designing pedestrian crossings now regularly add side islands to their crossing points. Again, a great idea in principle. By reducing the width available for cars, you give people a shorter distance to cross, and somewhere visible to stand and be seen while they assess whether it’s safe to cross. But these side islands create pinch points for people on bikes. And AT keeps putting them in their designs and building them on our streets. Even when the crossing width isn’t that far in the first place, and sightlines already good. Even when – as is increasingly the way – the crossing is on a raised table or includes a zebra, obliging drivers to slow down and give way. That’s right: even when there is NO NEED to go the extra mile to endanger people on bikes, AT steadfastly refuses to change this problematic design, and rolls it out again and again. Here are three recent examples. The third one, you can do something about before 10 December. We’d love you to. Rosebank Road, although a key link to the Northwestern Cycleway for people coming from Avondale, isn’t a pleasant road to cycle on. It has heavy traffic, lots of trucks, and many, many wide driveways. But it also has an oddity which balances this slightly: nice wide shoulders, with parking prohibited. This creates de facto bike lanes – not protected, but a nice refuge for people going this way. So when AT recently proposed adding pedestrian refuges along this street, we were shocked to see that at one of the locations, they proposed adding side islands, creating a totally unexpected blockage (grinding teeth). Why? Why Indeed. Note the handy bus demonstrating the specific danger for people on bikes all too clearly. Unexpected, and unnecessary. While the side islands would reduce the crossing for pedestrians by maybe a metre, the new middle island already shortens the crossing substantially, breaking it into two steps. Also, parking is prohibited along here, so it’s not like pedestrians need extra shelter when stepping out between parked cars. And the road is straight, making visibility very clear. Regardless, a designer felt they could just narrow the lane down. We could find no reason for these side islands at this location (see it for yourself in Streetview (with a truck approaching in the distance, demonstrating the danger to people on bikes). So we raised hell about this design. Because if AT goes ahead and builds it as proposed, this island may one day be the cause of another cycle fatality, with some poor person dragged under a set of truck wheels. This is not #VisionZero. This is the one you can do something about. Alford Street in Waterview is a typical local road in a residential burb built decades ago. It’s dead straight (nice racetrack!) and very broad: 9.5m of wide carriageway with parking on both sides (in contrast to a more modern standard of 5.5-6.5m, where parking, if provided at all, is indented into the berms). These days, Alford Street is also a key bike route, leading to the signalised crossing over Great North Road toward the Waterview Shared Path via the new bridge over Oakley Creek. While Alford has no bike facilities as such, it is the key local route for people from the neighbourhood to ride to their awesome new bike path. You’d think that AT, at least here, would see bikes in the picture. Alford Street in red. The rough route of the Waterview Shared Path in blue. The red circle shows the new road crossing. Waterview Shared Path – a nice route for all ages. But you have to get there first! Currently, there aren’t many parked cars on Alford St, as can be clearly seen on the aerial photos and on Streetview. So if you cycle here, you’ll likely be travelling close to the kerb, and drivers would expect you to. They would not expect you to move into in “their” lane, and might be pretty cross if you did. So AT comes along and proposes a new raised crossing to slow traffic down and improve walking access to a local park (applause)… and then adds some of the widest side islands we have yet seen (grinding teeth). WHY?? We can find no reason for these side islands here. The raised table will slow drivers down, making the crossing massively safer for pedestrians. Pedestrians will have the right of way, and the parking prohibition ensures good sightlines before you step out. 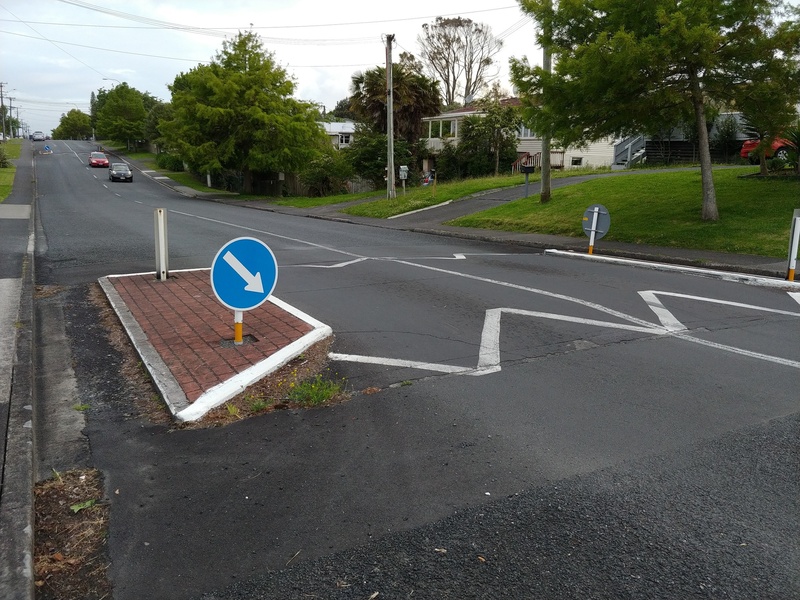 It’s not even as if there’s an existing crossing with side islands that ‘needed’ to be retained (yep, that’s an actual thing we’ve encountered from AT). Moreover, even if AT wanted side islands here, they could make them ~0.5m wide, instead of some 2m deep, and leave a lane width of 4.2m, plenty safe for a car to pass a bike. Granted, this design is less brutal than the one on Rosebank Rd. No central island means that a driver can pass a bike safely even while going over the crossing, as long as no car (or bike!) is coming the other way. The occasional parked cars along the road will hopefully mean drivers are alert to the possibility that they may need to suddenly share the lane with a person on a bike. And the slower speeds in general should make any sideswipe crashes that do happen here less terrible. But still, we ask “Why?” Why create an unpleasant choice and increase danger for people on bikes, almost casually, almost as if you hadn’t even really thought about it? We’d be willing to feel generous if this was a one-off, done in good faith to improve pedestrian safety on an excessively wide road. But considering how many times we have previously raised this specific concern – how many times we’ve begged AT not to jeopardise the safety of people on bikes by building these side island designs – we still see them proposed, and built. We support safer and better pedestrian crossings, and have done so during dozens of consultations. So we’d normally celebrate this one in Waterview too. But not when it involves trading off the safety of people on bikes. Tell AT to up their game. Ask AT to redesign this crossing – before 10 December! No more pinch points for people on bikes! Important post, thanks! Does the draft Transport Design Manual have better designs for pedestrian crossings? Not sure about the Transport Design Manual but It’s worth mentioning that both ATCOP and PPDG discuss this issue and have some designs. Here is another option although the side islands are too wide for this road. The majority of the crossings along this road only use a centre island. And a similar style speed bump, again with the side islands too wide. Cleaning can be an issue with these designs as debris tends to get swept into the outside lane. Maybe it makes sense to paint cycle lanes in those situations as a matter of course. Even if they’re not really safe and even if most people don’t really want to use them, it’s still obvious to not block lanes with islands. Well that abuse will come anyway. Do you think, without cycle lanes, you won’t get abuse for not riding in the gutter? I find that I get less abuse if the narrow shoulder is not marked as a cycle lane. People are more willing to cross centre line/median to pass if its a shoulder. So you don’t live in Auckland, but you post rather bluntly and rudely on other Auckland focused forums ? Have you ever lived in Auckland ? I grew up in Auckland. I am currently living in London, as many Aucklanders choose to do for short periods in their 20s. While I agree that my comments are blunt, perhaps you should use you should be careful to call my comments rude given that your house is made of glass. I presume you know me from Greater Auckland, the one bad thing about their blog; you can’t block concern trolls. Maybe the cheaper pedestrian crossings they weren’t allowed to trial at Future Streets is the better answer than pedestrian refuges anyway? I truly hate the pedestrian refuges – they are built for single adults. A parent with buggy and a child on a small bike beside them can’t fit. Nor can a small group of 11 year olds out for a ride but needing to cross the road. There’s just not enough width. 90% of Auckland’s traffic light intersections have a pinch point built in as they squeeze in an extra right turning lane. This means cyclists struggle to get to the advance stop box (ASB) and when they do its often unpainted, and underneath a car. Tamaki Drive Ngapipi intersection is an accident waiting to happen, both for the T2 lane encouraging the close pass on the way into the city and the bike lane to bus stop to park car interface on the way out.